This article was first published in the October 5, 2014 edition of the Montana Standard written by Kelly Christensen (kelley.christensen@mtstandard.com). You can view the full version of the article here. 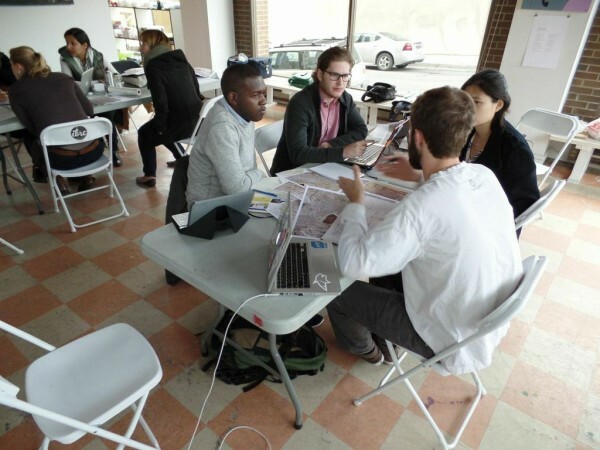 This weekend, students from Montana State University in Bozeman and Columbia University in New York gathered to generate ideas to use Butte’s reclaimed Superfund areas as more than vast swaths of grassland, but as places to foster community participation. The group, made of mostly master’s degree students in MSU’s college of architecture and Columbia’s Earth Institute sustainability management program, generated three ideas to re-imagine Missoula Gulch as more than unused fields and storm water drainages. Bradford Watson, an assistant professor of architecture at MSU, said that by reclaiming the open spaces to create places of value to Butte’s citizens, the community can make Missoula Gulch more than a gully for storm water runoff that has long-term operation and maintenance costs without any true civic purpose. 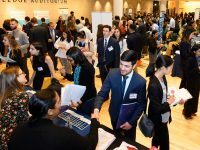 The three proposed projects had a number of solutions. The first project proposed terracing Missoula Gulch with slight changes in grade and slope to slow storm water. It also proposed using bio-solids from the waste water treatment plant that are currently sent to the landfill to enrich the soil and build a better ecosystem for a number of native plants and trees. The second project proposed using the Anselmo Mine Yard buildings as a community gathering space to educate the public about Butte’s complex water system, and also as a center that can be used for events. 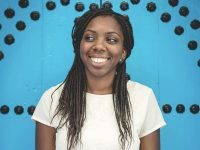 The project mentioned how the Evergreen Brick Works in Toronto, Canada, a historic brick quarry, was transformed into such a space by a nonprofit organization with the help of grants and community fundraising. 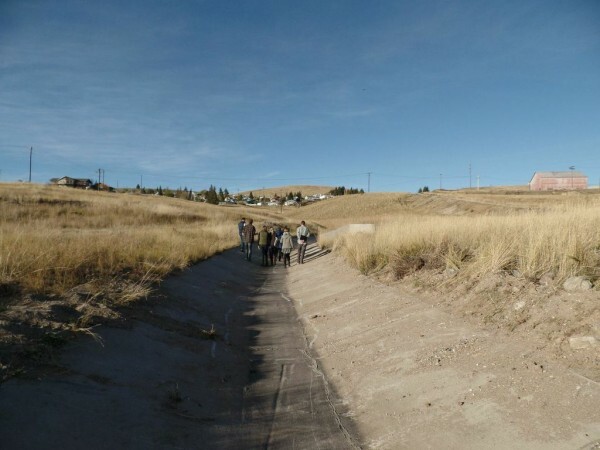 The project proposed using the Anselmo as a starting point for a new landscape meandering up Missoula Gulch, and of a citizen initiative to capture rainwater for gardening and watering lawns instead of funneling it down the hill as runoff. The final project focused on framing spaces in Butte with large steel frames to demonstrate the use of art in the landscape, and to make parts of Missoula Gulch above the Anselmo a park for Butte residents to interact with the landscape. She said she hopes the Butte community can reorient its criticism into a love of place and into creating a completely new environment in Butte. “We don’t really know what this place was before, so it can be anything,” she said. Watson said that Butte’s rich history is a jumping off point for a vibrant future of community participation and intentional reclamation of space. Students taking a walk along the Missoula Gulch, one of the major waterways in Butte during heavy rainstorms. Missoula Creek was one of the places where gold was first discovered, leading to Butte’s founding. 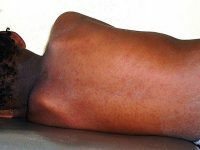 The mining industry filled the creek with waste rock and mine tailings, which contain arsenic, lead, sulfur, and other toxins. Through Superfund cleanup investment, a 22″ soil cap was laid over the tailings and seeded with grasses. The base of the gulch was reinforced with a concrete culvert to reduce erosion. 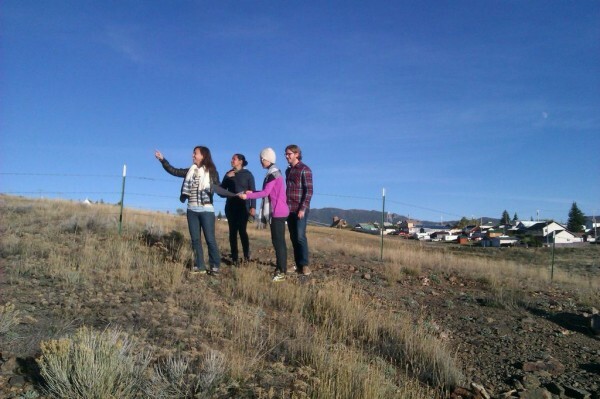 Four MS students – Laura Tajima, Sisi Zhu, Shawn Peterson, and Marivi Perdomo Caba – overlooking the Missoula Gulch. Unfortunately, with the steep topogrraphy, intensity of Butte’s rainfall and underdeveloped plant roots, the 22″ soil cap can fail – sometimes as many as seven or eight times in certain locations. 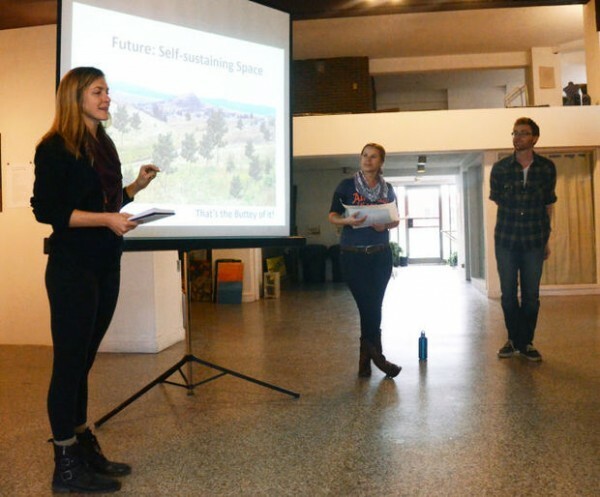 The students’ weekend workshop sought to reconsider ways of remediating the Missoula gulch. 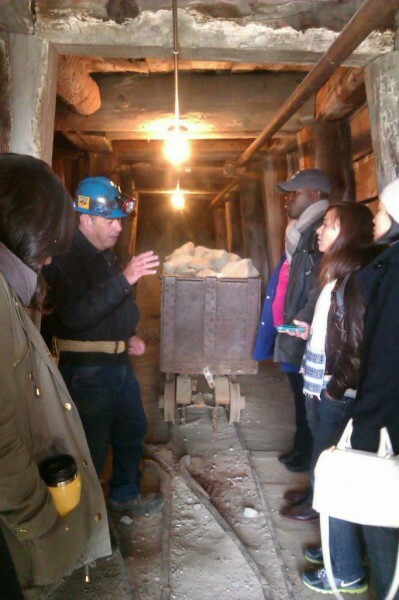 MS students take a tour of the World Mining Museum with their guide, Tom, who worked as a hard rock miner in Butte’s copper mines for 26 years. MS students collaborating in the Imagine Butte Resource Center on Saturday morning to prepare their projects.